GAMSAT Preparation: Where to Start? Practice makes perfect: 10 GAMSAT mock exams! Online access tools (detailed worked solutions, background videos, etc.) are accessible by book owners using the online access code which comes with your book, affixed to the inside back cover. First, register for a free account, then login and click on the red button 'Gold Standard Textbook Owners' in the right column and follow directions so that you can use your online access code to begin using your online resources. Gold Standard 3-month GAMSAT Study Schedule | How Much Time Should I Study for the GAMSAT? D ACER's GAMSAT Information Booklet; Gold Standard (GS) GAMSAT book's section on Understanding the GAMSAT - GAMSAT Section 1 Resources GS Chapter Review for Section II - Writing the Introduction, Supporting Your Thesis, Organisation and Structure, WritingTask A, Writing Task B, Timing, The Five-Minute Five-Step Plan, Section 2 Vocabulary (book or ebook) GAMSAT Section 1 Resources View videos: GS GAMSAT Biology Graph Analysis Recorded Webinar - Parts 1, 2, 3 (online) Consolidation Sunday: review your Gold Notes from the beginning and consolidate what you learned from the beginning. *If you have registered for the Gold Standard GAMSAT Essay Correction Service and would like to have your essays from the ACER GAMSAT Practice Question Booklet marked, you may email your request to jeanne.tan@gold-standard.com. Focus on developing your reasoning skills. Do not simply study and regurgitate facts. Reasoning rules in the GAMSAT. D GAMSAT Section 1 Resources The Meaning of Things by AC Grayling (book) - Moralising, Tolerance, Mercy, Civility, Compromise, Fear, Courage, Defeat, Sorrow, Death GAMSAT Section 1 Resources The Meaning of Things by AC Grayling (book) - Hope, Perseverance, Prudence, Frankness, Lying, Perjury, Betrayal, Loyalty, Blame, Punishment GAMSAT Section 1 Resources The Meaning of Things by AC Grayling(book) - Delusion, Love, Happiness, Nationalism, Racism, Speciesism, Hate, Revenge Consolidation Sunday: review your Gold Notes from the beginning and consolidate what you learned from the beginning of each subject. *If you have registered for the GS GAMSAT Essay Correction Service, we suggest refining your practice essays based on our markers' comments. NOTE: While many of these topics are interesting, they are hardly typical themes in GAMSAT Section 2. ACER has always been very careful in choosing subjects that are not morally and culturally offensive to candidates. GAMSAT Section 1 Resources GAMSAT Section 1 Resources Consolidation Sunday: review your Gold Notes from the beginning and consolidate what you learned from the beginning of each subject. Exercise regularly. Take short breaks in between your study. A fit body keeps the mind fit. D GAMSAT Section 1 Resources The Meaning of Things by AC Grayling (book) - Poverty, Capitalism, Reason, Education, Excellence, Ambition GAMSAT Section 1 Resources The Meaning of Things by AC Grayling (book) - Acting, Art, Health, Leisure, Peace, Reading, Memory GAMSAT Section 1 Resources GAMSAT Section 1 Resources Consolidation Sunday: review your Gold Notes from the beginning and consolidate what you learned from the beginning of each subject. When you feel like quitting, remind yourself that you'll have to return to this later anyway but from the very beginning. D GAMSAT Section 1 Resources The Meaning of Things by AC Grayling (book) - History, Leadership, Travel, Privacy, Family, Age, Gifts, Trifles GAMSAT Section 1 Resources - GAMSAT Section 1 Resources GAMSAT Section 1 Resources Consolidation Sunday: review your Gold Notes from the beginning and consolidate what you learned from the beginning of each subject. D GAMSAT Section 1 Resources GAMSAT Section 1 Resources GAMSAT Section 1 Resources GAMSAT Section 1 Resources GAMSAT Section 1 Resources - Consolidation Sunday: review your Gold Notes from the beginning and consolidate what you learned from the beginning of each subject. *If you have registered for the Gold Standard GAMSAT Essay Correction Service and would like to have your essays from the GS Free GAMSAT Practice Test marked, you may email your request to jeanne.tan@gold-standard.com. Gold Standard GAMSAT Essay Correction Service - If you have registered for the Gold Standard GAMSAT Essay Correction Service, you have the option to have your practice essays marked from the ACER GAMSAT practice booklet, the GS GAMSAT Practice Test or from the practice quotations provided in your programme. For further enquiries, you may email jeanne.tan@gold-standard.com. A healthy mind is maintained by a healthy body. Go out and exercise. All those endorphins released at the gym are guaranteed to make you feel and think better! *If you have registered for the Gold Standard GAMSAT Essay Correction Service, you have the option to have your practice essays marked either from the GS GAMSAT Practice Test or from the practice quotations provided in your programme. For further enquiries, you may email jeanne.tan@gold-standard.com. "In case of doubt, push on just a little further and then keep on pushing." – General George S Patton, Jr.
*If you have registered for the Gold Standard GAMSAT Essay Correction Service, you have the option to have your essays marked from any practice test or from the practice quotations provided in your programme. For further enquiries, you may email jeanne.tan@gold-standard.com. ** If you prefer to use other tests that you have access to, you can substitute them in here. You are almost done. Keep going! You don't want to look back later and know you could've done better. You have persevered. You have dedicated yourself to GAMSAT preparation. Be ready to give your best in the real exam! The first step to an effective study preparation is to identify your strengths and weaknesses. Would Physics be your strongest, followed by Biology, then General Chemistry with Organic Chemistry and Humanities as the weakest? Do you even need some guidance in the Section 2 writing tasks? Consider your undergraduate background. If you have a science background, starting with Section 1 review (Reasoning in Humanities and the Social Sciences) could be your best move. On the other hand, candidates with a non-science background are recommended to prioritise their science review. As we always say at the Gold Standard, "If you are wondering which subject to review first, start with the subject you 'hate' most (or know least about)!" Of course, your best source remains to be ACER's practice materials. As soon as the GAMSAT Information Booklet is available, download it and carefully read the details. Alternatively, you can get an overview of the GAMSAT, how it is scored, and the testing locations on our GAMSAT 2019 page. Sit a diagnostic test. ACER offers five practice tests, one is free with registration and 4 are available for purchase. When you register for the GAMSAT, you will get one of the ACER booklets for free. 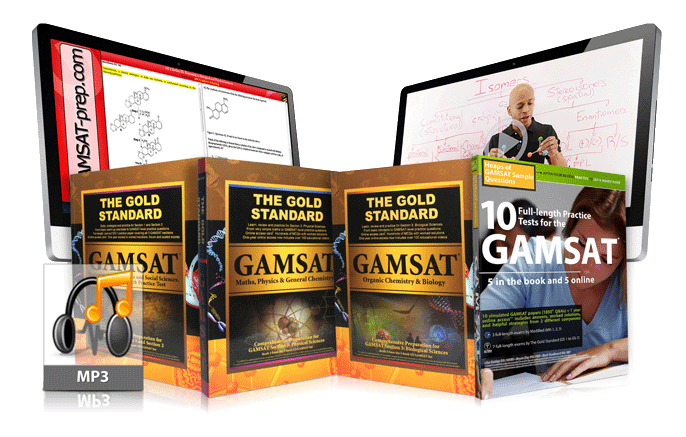 Another free alternative is the Gold Standard Free GAMSAT Practice Test. Your GAMSAT revision timetable must include post-test analysis. Ideally, you would review the explanations for each question, thoroughly understanding why you got certain answers wrong. For ACER's GAMSAT Sample Questions ('blue booklet'), GAMSAT Practice Questions ('red booklet'), Practice Test 1 ('green booklet'), Practice Test 2 ('purple booklet') and Practice Test 3 ('pink booklet'), Gold Standard has uploaded more than 20 hours of worked solutions to YouTube covering 500+ multiple-choice Section 3 questions for free: Gold Standard GAMSAT YouTube Channel. However, before sitting full-length practice GAMSAT tests, you should complete your content review so that you can use practice tests as trial runs. We have constructed an additional 10 full-length simulated exams should you require the extra practice. After assessing your strengths and weaknesses using the three methods described above, you may now rank the subjects according to how you deem each in terms of difficulty. You can then determine how often in a week you would need to study your weakest subject (ranked as number 1, i.e., your top priority) down to your strongest (ranked as number 5). Our recommendation is that you study your most and second most difficult subjects, as well as your easiest subject, twice a week. As to the number of hours per day that you need for revision, an average of 3-6 hours would be ideal. Nevertheless, this should be realistically determined relevant to your university classes and/or working hours. Your academic grades also spell a difference. GAMSAT prep can take as long as 4 to 6 months if you averaged a C or if you have not taken two or more of the science courses at the undergraduate level. Granting you have taken all science sections and averaged an A, three months or less may be all you need. For information about Gold Standard GAMSAT textbooks, teaching videos, live courses on campus, and online programmes, please return to our home page.